Current Sale: All 7k Rockwell Axles (we can build any size) just $400! 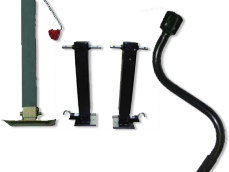 All parts of the trailer including hardware for trailer brakes, trailer kits, receiver hitches, brake drums, dexter axles, ball mounts, hubs, vents and more. If you don't see what you need, please give us a call at 800-239-6825.